Melsa Ararat, the head of TKYD Academic Board has written about the priorities of corporate boards for 2016 in Turkey for the TKYD journal. Please see the article here. Business Against Domestic Violence Project Launch will be held on 15th of April, 2014. The Project launch will be held at the Consulate General of the Netherlands on April 15, 2014. Business representatives, academicians and opinion leaders will share their ideas about domestic violence at a round table event and the project details will be shared with press and media. The round table event will bring together researchers and business world representatives to review what has been done up to now or currently is under way concerning domestic violence in Turkey and discuss what is needed for the future. For further details please click here. European Professional Women's Network(EPWN), an online networking and leadership development platform for professional women, will be launched on 20th of November at The Sofa Hotel, Teşvikiye in Istanbul. The honoured guest of the launch will be Marijo Bos, EPWN'S President. Melsa Ararat, Director of Corporate Governance Forum of Turkey will give a speech in official launch of EPWN. Melsa Ararat was involved in the opening launch of ‘Corporate Social Responsibility for All Project’. E-General Assembly, supported by also CGFT, has received the award under FSTech Awards. The Electronic Assembly System (E-GKS), which provides an electronic platform for electronic voting to the shareholders of listed companies in stock Exchange, has received ‘Best Use of Online Services’ award in the scope of FSTech Awards. The ‘Independent Women Directors’ Project, which aims to help publicly listed companies to give priority to women in nominating independent board members and help strengthen the position of women in decision making mechanisms, was announced to the public and press with a launch event on 13 December 2012 at Conrad Hotel, Istanbul. Candace Johnson, Coordinator of the ‘Global Board Ready Women’ Project delivered a key note speech at the event. Melsa Ararat, Director of Sabancı University Corporate Governance Forum of Turkey, and George Dallas, Director of Corporate Governance at F&C Investments in London, wrote an article called “Corporate Governance in Emerging Markets: Why It Matters to Investors—and What They Can Do About It”. The article is published in 22nd issue of Private Sector Opinion which is Global Corporate Governance Forum Publication. Melsa Ararat, the director of Sabanci University’s Corporate Governance Forum (CGFT) and the director of Carbon Disclosure Project (CDP) Turkey joined Climate Bonds Initiative Advisory Panel along with Murray Ward from New Zealand and Nelson Switzer from Canada. Fourth UN Conference on Least Developed Countries (LDCs) will be held in Istanbul Congress Center (ICC) on 10 May 2011. The conference is organized by UN Global Compact, UNEP Finance Initiative and Principles for Responsible Investment. There will be a session on Sustainable portfolio investment and finance in LDCs and Sabanci University Corporate Governance Forum Director Dr. Melsa Ararat will give a speech about the best and emerging practices for investing into frontier markets and least developed countries (LDCs). She will also focus on the various sources of capital and investment into LDCs and on how institutional investors could go about assessing the impact of investments into EM or LDCs. Together with Melsa Ararat, there will be speakers from IFC, International Organisation on Migration (IOM) Turkey and Government Employees Pension Fund, South Africa. IFC supported Emerging Markets Corporate Governance Research Network (EMCGN) issued its 2. Research Bulletin. Melsa Ararat, the coordinator of the Network and the director of Sabanci University Corporate Governance Forum (CGFT), and Mehmet Ihsan Canayaz, PhD student at the Faculty of Management, are the editor and the associate editor of the Bulletin respectively. The report was written by a team headed by Melsa Ararat, the director of CGFT. The report is covered by the media in Turkey. The report series cover sustainable investment conditions in key emerging markets such as India, China and Brazil. 50 companies falling under the ISE-50 indices have been invited by CDP Turkey in the year of 2010. 10 of those companies and a volunteer company responded to CDP’s invitation and presented their carbon emission levels and risk management strategies to international corporate investors. In the year of 2011 again, under the same partnership, Turkey’s largest 100 organizations falling under the ISE-100 indices, are invited by CDP to share their carbon emission levels and climate change related strategies. Invitation letters and questionnaires will be posted to organizations’ chairman of the board of directors by CDP’s London Headquarter in February 1, 2011. Right after, organizations’ general managers and investor relations departments will be contacted. Similar to last year, two instructive workshops, focused on information sharing, will be proposed this year too. The newsletter will identify and summarize recently published articles in key journals and working papers. It will also serve to inform the network of corporate governance researchers and practitioners about new events (conferences and workshops) on corporate governance in emerging markets. Melsa Ararat, The director of CGFT is the editor of the new bulletin and Mehmet Ihsan Yazici, PhD candidate in Sabanci University is the associate editor. The Second International Conference on Corporate Governance in Emerging Markets was held in Sao Paulo on 1-2 July 2009. The conference was one in a series of events organized by Emerging Markets Corporate Governance Research Network (EMCGN) supported by the Global Corporate Governance Forum (GCGF) at IFC. The report authored by Melsa Ararat (Sabanci University) and Burcin Yurtoglu (Vienna University) together with Ricardo Leal (UFRJ) is disseminated by the GCGF. The 2. International Corporate Governance Conference organized by the Turkish Corporate Governance Associaton will take place on the 14-15 January at Pera Museum. Melsa Ararat, the director of Sabancı University’s Corporate Governance Forum will be speaking in a special session on the ‘ Corporate Governance Score of Turkey’ on the second day of the conference. The Second International Conference organized by the Emerging Markets Corporate Governance Network will take place in Sao Paolo, Brazil. The First Conference was hosted by CGFT, Sabancı University in November 2007. CGFT director Melsa Ararat has been the coordinator of the Network since 2007. Coppead Graduate Business School at the Federal University of Rio de Janerio and the Getúlio Vargas Foundation Law School will host the Second Conference. Melsa Ararat is elected to the Awards Committee of the International Corporate Governance Network. - Exceptional achievements in the corporate governance field. - Contributions to significant improvements of corporate governance practices in one or more jurisdiction. - A positive impact with long term significance on one or more economies. - Success in confronting frustrating actions to corporate governance, requiring vision, courage and fortitude. - Enhancement of their future corporate governance initiatives through such recognition by the ICGN. The awards are given since 2001; the first receivers being Adrian Cadbury (UK), Ira Millstein (USA) and Professor Hasung Jang (Korea) . For more information, please see the ICGN Web site. 9. European Workshop on Corporate Governance and Investments will be hosted by CGFT(7-8 November). CGFT has completed the fourth year study of the disclosure practices of Turkish firms and announced the results to the press on the 18th of September 2008. The study is a joint effort of S&P and CGFT. The report of this years’ study is published by S&P on its’ Rating Direct Web site. The study notes that the improvement in the disclosure levels of Turkish Companies has converged around IFRS and no improvement is reported since last years’ study. CGFT supports the Workshop on Corporate Governance in Emerging Markets sponsored by IFC’s Global Corporate Governance Forum (GCGF) and sponsored and hosted by Yale University’s Millsetin Center for Corporate Governance and Performance. CGFT has been provided with a grant by the GCGF to support the process of commissioning research on its behalf. Commissioned papers which were selected through a competitive process will be presented on 19-20 September at Yale. The 9th European Workshop on Corporate Governance and Investments will be hosted by Corporate Governance Forum of Turkey (CGFT) at Sabancı University, Faculty of Management on 7-8 November 2008. The details can be found in the attached document. The article “Different Approaches to Differentiating 'Better Governed' Companies - Market Segmentation in BOVESPA and Rating Based Indexing in ISE” written by Melsa Ararat with Burçin Yurtoğlu from University of Vienna, was one of the top downloaded articles in Emerging Markets - Finance section of SSRN electronic library. SSRN is the most prestigious and biggest e-library which contains articles and publications on business administration, law and economics. A popular version of the article is published by IFC Corporate Governance Forum in Focus series and can be downloaded from http://www.gcgf.org. Sabancı University Corporate Governance Forum hosts the International Conference on "Corporate Governance in Emerging Markets". The Forum seeks to address corporate governance weaknesses of middle income and low-income countries in the context of broader national or regional economic reform programs. Thus, the research activities are expected to support policy development for sustainable economic growth and poverty reduction within the framework of agreed international development targets. Capital Markets Board has organized a workshop in Istanbul to understand the issues faced by listed companies in implementing the CMB' s Corporate Governance Principles. The workshop was attended by invitees from market participants, issuers, NGOs, and the government. Melsa Ararat and Hakan Orbay of Sabancı University Corporate Governance Forum participated in the workshop. Turkey Global Competitiveness Report prepared by Competitiveness Forum has been published. Sabancı University Director of Corporate Governance Forum Melsa Ararat and Vienna University Staff Of Economy Faculty and Sabancı University Network Staff have contributed to the report with “Governance and Global Competitiveness” section. 10. Internal Audit Congress which is organized by Turkey Internal Audit Institute traditionally every year has been done in Crown Plaza Hotel/ Ataköy, İstanbul on 17 November 2006.Director of Corporate Governance Forum Melsa Ararat has taken a place “Europe’s Corporate Governance Action Plan and Corporate Governance Perspectives” speech. Within International council meeting “Corporate Governance in Public Firms and Family Firms” conference was held with the attendance of Chairman SU Board of Trustees Güler Sabancı and University President Prof.Dr.Tosun Terzioğlu. Council President of Bekaert Baron Paul Buysee and ex-council president of deutsche Bank Dr.Rolf E.Breuer-members of International council have attended as a lecturer to the conference with the Dean of Faculty of management Prof.Dr.Nakiye Boyacıgiller. Doç.Dr.Hakan Orbay has moderated the question-answer after the speech. Cooperation with the leading universities and Research Centers in Europe, CGFT has granted 2 million Euro from European Commission’s Marie Curie Research Education Network fund. The universities and research centers that have been formed in the consortium with the leadership of CEPR and ECGI are; Free University of Brussels, Center for Financial Studies (University of Frankfurt), University of Genova, Catholic University of Braban, University of Amsterdam, Center of Monetary and Financial Studies (Spain), SITE (Sweden), London Business School(UK), Swiss Federal Institute of Technology, University of Alberta(Canada), Princeton University, Yale University, Mannheim University, Standard and Poor's(UK), Hermes Pension Management(UK), Telecom Italia, Harvard College and SU-CGFT. In the project Director of CGFT-the only research center from a non EU country-Melsa Ararat is taking a place in consortium’s guidance commission. The Project envisions a co-operation for the education and guiding of postgraduates that have been chosen by consortium members for 3 years period. Consortium members are aiming researchers to reach a guiding and education facilities to achieve a competence for answering more complex questions in research centers. The workshop during the project will provide researchers’ studies to be discussed by the leading Corporate Governance researchers of Europe. The most recent issue of Corporate Governance: An International Review, is focused on Corporate Governance in Turkey. Guest edited by Burçin Yurtoğlu and Melsa Ararat, the volume includes four articles authored by FMAN faculty members. For the special issue, please click the link below. International Corporate Governance Network's general assembly and annual conference. The leading Corporate Governance practitioners' organisation International Corporate Governance Network is holding its 11. Annual conference and general assembly in Washington DC on 3-7 of July. The Presidents of the World Bank Paul Wolfowitz, Ira Millstein and Al Gore will deliver the key note speeches. Melsa Ararat, Director of Sabancı University's Corporate Governance Forum will take the floor with Simon Wong of McKinsey to open up the session on emerging markets. Melsa Ararat has also contributed to this year's year book with an essay on emerging markets. Sabancı University Corporate Governance Forum (CGFT) and Standard and Poor's (S&P) released the "2006 Transparency and Disclosure Study Report ". The report, released on the 6th of June, summarizes the results of the second phase of a 3 years study. The study investigates the corporate response to regulatory improvements undertaken by BRSA and CMB, and increased investor interest in Turkish stocks. The report concludes that the transparency of Turkish companies has been improved drastically over the past few years especially in the area of financial disclosure, but the formation and functioning of Turkish boards continue to be a black box for the investors. The data collected during the study is used as an input for ongoing studies on corporate governance of Turkish firms by the CGFT fellows. The 4. International Conference on Corporate Governance organised by Center for Corporate Governance Research at Birmingham Business School will take place on the 3rd of July 2006 at Birmingham University on the theme of Global Developments in Corporate Governance. Melsa Ararat, the director of Sabancı University Corporate Governance Forum will deliver a talk on the subject plenary panel chaired by Sir Adrian Cadbury. CGFT moderates the Multi-stakeholder Round Table in textile industry Stakeholders of the Turkish textile sector will kick off their 2006 Round Table series on the 29th of March in Ankara at the Ministry of Labour and Social Security. The objective of the Round Table is to improve the social standards of the sector in view of the European Union's social policies and expectations of European customers and consumers. CGFT' s director Melsa Ararat and Boğaziçi University Social Policies Forum's director Ayse Buğra will moderate the round table discussions. Director of Competitiveness Forum, Gündüz Ulusoy will deliver a key note speech at the Round Table. The Round Table will start with a press conference. Corporate Governance Forum has become the first Turkish Organizational Stakeholder of the Global Reporting Initiative (GRI). The Global Reporting Initiative (GRI) is a multi-stakeholder process and independent institution whose mission is to develop and disseminate globally applicable Sustainability Reporting Guidelines. The most reputable firms worldwide use GRI standards in their economic, social and environmental reporting in addition to financial reporting. Mieszko Mazur joined the Faculty of Management, Corporate Governance Forum within the scope of European Corporate Governance Training Network project. Mieszko, a graduate of Poznan University of Economics in Poland, started his PhD studies in the department of Investments and Capital Markets of the same University and continued his research with Prof. Huberman in Columbia Business School as a visiting scholar. Mieszko will continue his research in Corporate Governance Forum for the next 3 years. You are cordially invited to a seminar on Monday, December 12, 2005. Speaker: Zacharias Sautner, University of Oxford, Said Business School, Title : "Corporate Governance and the Design of Stock Option Programs "
Burçin Yurtoğlu, professor of finance at Vienna University and known for his work on the relationship between governance and performance, is visiting CGFT. Burçin has published extensively on CG system in Turkey. In “Family Firms and Instituting” conference organized by İstanbul Chamber of Commerce, Melsa Ararat, Hakan Orbay and Behlül Üsdiken will take place. “Family Firms and Instituting” panel that take a serious attention on ISO 2004 Congress will be comprehensively discussing with the academicians of CGFT and SU. 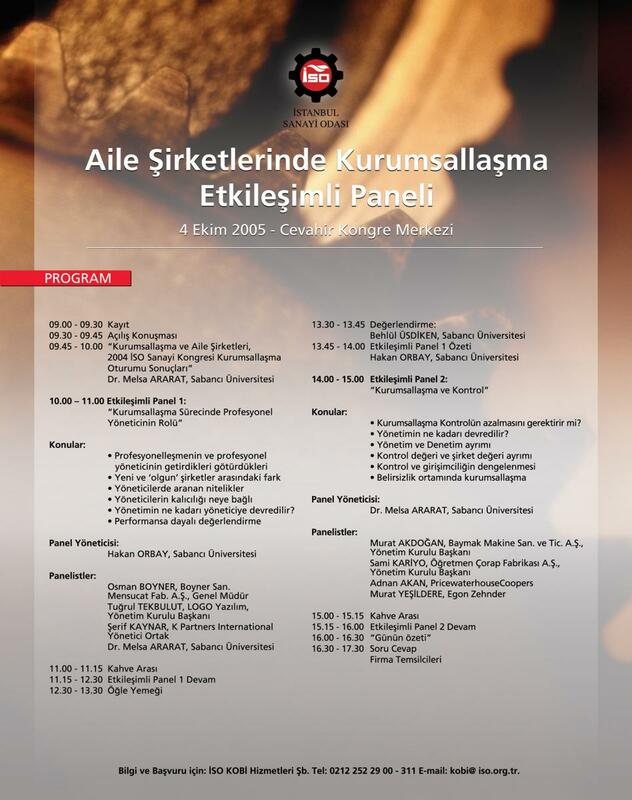 Conference that will be on 4 October in Cevahir Congress Center will discuss the subjects of 2004 Congress in depth. Transcript of “Family Firms and Instituting” panel on ISO 2004 Congress. CGFT contributes to "Instituting Professionalism in Family Firms"
CGFT and SU faculty will contribute to the event organized by Istanbul Chamber of Commerce on Family Firms. Melsa Ararat, Hakan Orbay and Behlül Üsdiken will lead the discussions to explore the subject which was the topic of a panel chaired by Melsa Ararat at ISO's 2004 annual congress. This year's event will build upon last year's panel. Two days strategic international conference will bring together the leading figures in London on 24-25 November to discuss the developments and perspectives of Turkey's capital markets. CGFT director Melsa Ararat will present a review of the Turkish corporate governance system. ICGN Annual Conference Will Be Held in London. World’s most active and comprehensive Corporate Governance activity ICGN (International Corporate Governance Network) Annual Conference will be held in 6-9 July in London. Director of Corporate Governance Forum Melsa Ararat will be directing the Dynamics of Administrative Council workshop. Workshops of the conference which bring leading names finance and law sector together with the organizers and legislatives, is defining the working program in the future. Director of CGFT Melsa Ararat has attended the meeting held in Amman, in purpose of getting ready for MDF5 meeting organized by World Bank and bringing the experts of CSR in MENA region. Click here for the newsletter of Jordanian Al Jadid Research Center discussing the meeting and informing about CSR MENA Project. SPK highlighting, capital market not involved in an international financial system can not help developing national economy has published the Corporate Governance Principles in July 2003. CGFT was in the project team developed by SPK for preparing the principles and contributed. SPK has published a guide for the reports which SPK asked how the public companies adjusted these principles reported in annual reports beginning from 2004. Akbank has announced that Akbank is the most transparent bank of Turkey according to the results of research executed with the cooperation of Sabancı University Corporate Governance Forum and Standard and Poor’s (S&P). At the meeting in Paris on 28 November 2003, institutional administration reforms were discussed for raising the accessibility to capital of the developing countries. Melsa Ararat, Institutional Administration Forum’s Director of Turkey, has also attended the meeting. Academicians of CGFT; Mine Aksu, Melsa Ararat, Hakan Orbay, Kemal Saatçioğlu and Burçin Yurtoğlu contributed to the questions prepared for Institutional Administration Grading Expertise Test organized by SPK. The test which will be about general economy, financial system, capital market, corporation law, institutional administration (public clarification and independent audit, internal control, risk concept, strategic planning and performance measurement) subjects, the first one will be in September 2005 and the second will be in January 2006. Click here for the transcript of “Family Firms and Instituting” panel in ISO 2004 Congress. The Corporate Governance Forum of Turkey has organized an international conference on Family Firms and Corporate Governance on May 20-22, 2004. At the annual meeting of the American Accounting Association (AAA) in San Francisco, August 7-11, 2005, our faculty member Mine Aksu was elected as one of the 14 Country Directors of the International Accounting Section (IAS) of the AAA for the second year in a row. As the Country Director for Turkey, some of her responsibilities are promoting membership in the AAA; nominating needy universities for gift memberships; starting a liaison between Turkish accounting/auditing associations and the AAA; and arranging for the announcements (and links) of international conferences organized in Turkey to appear on the IAS website. EMBA 2005 students received their certificates from the World Bank Institute upon completing the "Introduction to Corporate Social Responsibility" courses a part of Business Ethics course given by Melsa Ararat. "Experts Meeting" at Amman brought together the CSR `experts in the MENA region in preparations for the MDF5 (Mediterranean Development Forum) which will take place in February 2006 and will be organized by the World Bank. Click here for the special edition of Jordanian El Jadid Research Center's newsletter on the topic. The official report on the Transparency and Disclosure Study conducted by CGFT in cooperation with S&P on Turkish listed companies has been released. The opinions of corporate governance forum director, Melsa Ararat were published on CFO Europe magazine's October press. Corporate Social Responsibility Organization's "Private Sector Forum: Social Responsibility for Development" will take place on 30.11.2005 and Melsa Ararat will attend as a speaker. Ministers Mr. Ali Babacan and Mr. Abdullatif Şener and President of TÜSİAD, Mr. Ömer Sabancı will also attend. CGFT has started to work on creating a local and global research network to help funding and distributing theoretical and empirical research on Corporate Governance in Turkey. To achieve this there will be meeting and brainstorming event on 15.11.2007 at 18.15 hosted by Sabancı University Corporate Governance Forum. Sabancı University will be hosting a conference with the theme "Corporate Governance in Emerging Markets" in Istanbul between 15-17 November 2007. The conference is organized by Global Corporate Governance Forum (GCGF) and Asian Institute of Corporate Governance (AICG) and supported by major Corporate Governance Centers. This conference aims to ease the distribution of research about corporate governance in emerging markets. To achieve this a platform of theoretical and political perspectives will be set up to discuss the research about corporate governance in emerging markets and how to improve them in the future. Sabancı University Corporate Governance Forum hosted an International Network event in March 2007 in cooperation with the British Council. The Network Event brought together the young leaders from all over Europe including Sabancı University alumni to discuss the role of business in social development. Supported by FMAN faculty ( Melsa Ararat, Ahmet Öncü and Cenk Koçaş), the İstanbul event included real life investigations at Nejat Eczacıbaşı Foundation on the role of philanthropy, at Petrol-Is on TUPRAS privatization, at TGSD on social standards in textile industry, at KAGIDER on the role of women entrepreneurs and at an advertisement agency on the role of marketing. Sabancı University Corporate Governance Forum is hosting British Council's Network Effect event which brings together "Future Leaders of Europe"
50 European young men and women will come together to discuss the Role of Business in Social Development at Sabancı University. Organized by British Council, Istanbul meeting is on of the series of meetings which aims to bring together the future leaders of Europe. Participants commit to staying in touch as active members of the European society. The provocation paper for the meeting is written by Melsa Ararat, the director of Corporate Governance Forum. Ahmet Öncü and Cenk Koçaş form the faculty of management will support the initiative as moderators.